Installing a new shingles on your roof is not a complex project. However, in order to ensure that the roof is watertight it is important that the shingles and flashing are installed properly around a vent pipe or drain stack. The use of the correct sized vent boot as flashing will help to ensure a watertight seal. 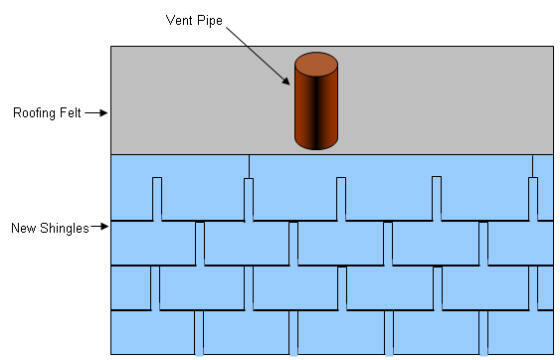 NOTE: Vent pipes vary in size. The outside diameter of a 4 inch cast iron vent pipe and a 4 inch PVC vent pipe are different. Make sure you purchase the correct boot for your your application. Apply the roofing felt on the roof, cutting a hole for the vent pipe. 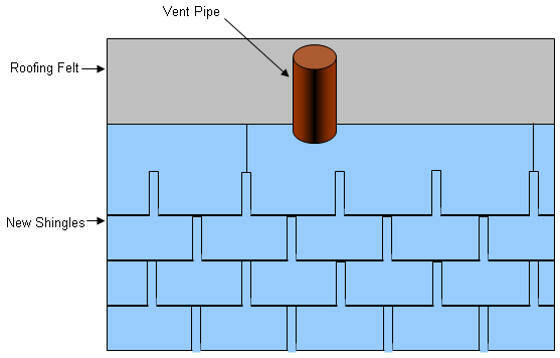 Apply the last row of shingles that is just below the vent pipe as shown in Figure 1. Continue the next row of shingles cutting a hole for the vent pipe. 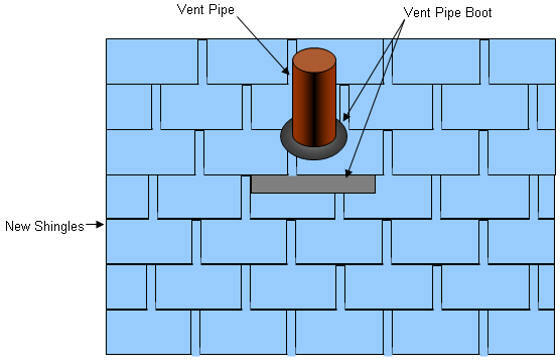 Use some asphalt roof cement under the cut shingle and around the vent pipe, as shown in Figure 2. 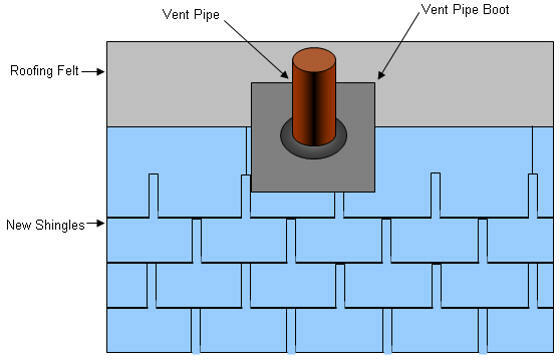 Apply a generous amount of asphalt roof cement around the vent pipe and place the vent pipe boot over the top of the pipe, covering the last course of shingles, as shown in Figure 3. If necessary, drive a couple of nails into the pipe boot on the top edge, in the corners. The asphalt cement, and the nails from the next course of shingles will hold the boot in position and seal it. Place the next course of shingles over the vent boot and install with a layer of asphalt cement. Do not over nail, nail only where and when necessary. Where nails have been used apply some asphalt cement over the head of the nail to ensure a watertight seal.